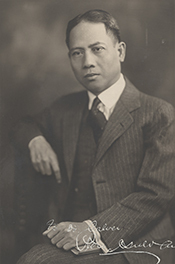 The longest serving Resident Commissioner from the Philippines and a protégé of Manuel L. Quezon, Pedro Guevara waged a difficult battle promoting Philippine independence while fighting congressional measures to curb territorial sovereignty and economic progress. Guevara acted for much of his career as the voice of the Philippine legislature in Congress in a low-key style of delivery that relied on prepared statements rather than fiery, impromptu speeches. Guevara began his career a stalwart proponent of independence, saying, “For 25 years I and my people have lived under the American flag. Yet wherever I go Americans take me for … some other Oriental. Americans know very little about us or our country, and they care even less than they know. To continue American control, under such conditions, is an injustice to the Filipinos.”1 But his perspective shifted in his final years as Resident Commissioner, and disagreements with his patron Quezon over the best path to independence led to his quiet retirement from politics. Upon Guevara’s return to the Philippines, senate president and Nacionalista Party powerbroker Manuel Quezon tapped his fellow senator to succeed Jaime de Veyra as Resident Commissioner. Domestic political jockeying momentarily complicated his nomination, however, when the insular government set a special election to fill the impending senate vacancy. Democrats put forward a nominee, but the Nacionalistas failed to produce a consensus candidate. Desperate to retain the seat, Quezon stalled by encouraging Guevara to remain in the senate until a suitable candidate could be found. The U.S. House of Representatives threatened not to seat the new Resident Commissioner so long as he held his Manila seat, forcing Guevara to resign and leaving Quezon to bargain with Governor General Leonard Wood on the timing of a special election. Nevertheless, the Filipino legislature elected Guevara as Resident Commissioner on February 17, 1923.4 He won re-election in 1925, 1929, 1932, and 1934 and served continuously until the position was reorganized under the Commonwealth of the Philippines in 1935. When Guevara set off on the long voyage to Washington, DC, in August 1923, a “monster parade” accompanied him to his ship, the Associated Press reported. A marching band and military cadets joined the throng, with Guevara at its head wearing a barong, a long embroidered shirt that symbolized Filipinos’ wish for independence.5 Guevara arrived in the U.S. capital in mid-September, months before the 68th Congress (1923–1925) was set to convene in early December. Like his predecessors, he played the part of diplomat rather than legislator, in some measure because House Rules prevented him from holding a committee assignment or voting on final legislation on the floor. But he also seemed quite comfortable working the press and serving as a public advocate. In that aspect, he went to work immediately. Even before he claimed his seat, he weighed in on independence and growing tensions with the controversial Governor General Wood. When the House adjourned in May 1928, Guevara remained in the United States. In June he joined Quezon at the Democratic and Republican presidential nominating conventions to promote Philippine independence. At the Republican convention in Kansas City, Missouri, the pair successfully lobbied against the inclusion of a platform that called for limiting Philippine rights. In Houston, Texas, Guevara and Quezon, with an assist from Senator King, convinced Democrats to retain a platform calling for independence that echoed the 1924 platform.30 Isauro Gabaldon resigned in July 1928, leaving Guevara the sole Filipino Resident Commissioner for nine months just as the battle over sugar tariffs was heating up. In December 1928, the House Ways and Means Committee convened hearings on tariff readjustments in anticipation of President-elect Herbert Hoover’s request to revise the Tariff Act of 1922. A worldwide depression in sugar prices and the rise of an aggressive sugar lobby threatened the free trade privileges enjoyed by the Philippines since the enactment of that legislation. The next hurdle Guevara and the mission faced came in the form of H.R. 2667, submitted by Ways and Means Committee Chairman Willis Hawley of Oregon. It called for a revision of the tariff schedules. The bill passed the House without many changes that affected the Philippines. But led by beet supporter Chairman Reed Smoot of Utah, the Senate Committee on Finance offered amendments sharply increasing the duty on sugar and other products from the Philippines. In contrast to Osias’s fiery testimony, Guevara submitted a prepared statement to the committee in June 1929, again requesting equal treatment between the United States and Philippines. He once more leveraged the economic conflict to request independence. Retained as a territory, Guevara noted, the matter amounted to interstate commerce. Passing the amendments, however, “would place the United States in the same position of Great Britain in her dealings with the thirteen American Colonies which brought about their separation from the mother country.”33 Smoot’s amendments gained little traction before the committee reported the bill in September 1929. Guevara carried forward his comparison of the islands to the American colonies as he continued his pleas for independence across the United States.36 In the summer of 1931, Quezon published a report postulating a 10-year trial period of autonomous government ending in a plebiscite. The report muddled the insular government’s official stance on independence. Quezon seemed to favor an American protectorate with only limited independence. The legislature instructed Guevara to continue to press for full independence and urged him weeks later to correct a Washington Post editorial which had presumed Moro opposition to independence.37 Guevara struggled to respond to this misinformation as Congress prepared to convene the 72nd Congress (1931–1933) in December 1931, and government leaders Osmeña and Roxas themselves traveled to Washington to make their case. Despite the efforts of retentionists to portray the Philippines as deeply riven over the question of independence, supporters in Congress had grown plentiful enough by 1932 to advance a new bill for Philippine independence. Named for the chairman of the House Insular Affairs Committee, Butler Hare of South Carolina, the proposal, once approved by the insular legislature, would provide for an immediate constitutional convention followed by an eight-year schedule for independence. Speaker John Nance Garner of Texas rallied Democratic support and brought the bill to the floor under a suspension of the rules, limiting debate to 40 minutes. During debate, Guevara proclaimed that this bill would “decide the fate of 13,000,000 people.” Describing prior legislative efforts as temporary fixes, Guevara deemed that the Hare measure embodied the “redemption of American pledges … and the fruition of our hopes for separate nationhood.” At the conclusion of Guevara’s unusually impassioned rhetoric, many Members rose in applause. With Guevara watching, the House approved the bill by a large majority, 306 to 47.38 The Hawes–Cutting bill, a competing Senate version of the Hare bill, led a conference committee to increase the window to independence to 10 years, but the final legislation was completed before the year was out. 1Guevara quotation from “Filipinos Hoping For Protectorate,” 8 November 1923, Christian Science Monitor: 2. 2Congressional Directory, 74th Cong., 1st sess., 2nd ed. (Washington, DC; Government Printing Office, 1935): 129; “Death Strikes Guevara in Act of Pleading Case Before Supreme Court,” 20 January 1938, Manila Tribune: 1; “Pedro Guevara, Jr,” 22 November 1947, Washington Post: B2. Pedro Guevara Jr., was born circa 1903. “Filipinos Elect an ‘Independent,’ ” 7 March 1923, Christian Science Monitor: 1. 3Congressional Directory, 74th Cong. : 129 ; “Death Strikes Guevara In Act of Pleading Case Before Supreme Court”; Bernardita Reyes Churchill, The Philippine Independence Missions to the United States, 1919–1934 (Manila, PI: National Historical Institute, 1983): 37–38, 428. 4Frank H. Golay, Face of Empire: United States-Philippine Relations, 1898–1946 (Quezon City, PI : Ateneo de Manila University Press, 1997): 242–244; Churchill, The Philippine Independence Missions to the United States, 1919–1934: 67; Pedro Guevara certificate of election, (endorsed 24 February), Committee on Elections (HR68-AJ2), 68th Congress, Records of the U.S. House of Representatives, Record Group 233, National Archives and Records Administration, Washington, DC; “Gabaldon, Guevara Re-elected,” 10 November 1925, Manila Times: 1; “Philippine Legislature Elects Commissioners,” 8 February 1929, Washington Post: 9; “To Represent Philippines Here,” 23 August 1934, Wall Street Journal: 5. 5Associated Press, “Manila Holds Huge Parade in Honor of New Agent to U.S.,” 12 August 1923, Chicago Tribune: 13. 6“Independence Haste Decried,” 12 September 1923, Los Angeles Times: 17; “Philippine Envoy Seeks Settlement,” 17 September 1923, New York Times: 19. 7“Filipinos Hoping for Protectorate,” 8 November 1923, Christian Science Monitor: 2. 9Churchill, The Philippine Independence Missions to the United States, 1919–1934: 70–74. 10“Hart Defends Leonard Wood,” 9 November 1923, Boston Daily Globe: 24. See also “First Philippine Plea Is Given to President,” 16 December 1923, Washington Post: 14; Churchill, The Philippine Independence Missions to the United States, 1919–1934: 77. 12Coolidge commented on the Philippines in his third, fourth, fifth, and sixth annual messages. See Gerhard Peters, “State of the Union Addresses and Messages,” in American Presidency Project, ed. John T. Woolley and Gerhard Peters, http://www.presidency.ucsb.edu/sou.php. 13Churchill, The Philippine Independence Missions to the United States, 1919–1934: 91–92. 14Hearing before the Senate Committee on Territories and Insular Possession, Philippine Independence, 68th Cong., 1st sess. (11, 16 February and 1, 3 March 1924); Churchill, The Philippine Independence Missions to the United States, 1919–1934: 89–90. 15Churchill, The Philippine Independence Missions to the United States, 1919–1934: 101–102. The amended bill removed the independence plebiscite and reduced the probationary period to 20 years. Commonwealth officials would support the Philippine constitution instead of the U.S. Constitution and no one with military experience would serve as U.S. commissioner. Regarding executive and legislative branch powers, the power to muster the armed forces would remain with the U.S. President; the U.S. Supreme Court also would have jurisdiction over the Philippines. 16Congressional Record, House, 68th Cong., 2nd sess. (16 December 1924): 698. 17Churchill, The Philippine Independence Missions to the United States, 1919–1934: 99–105. 18Ibid., 122–124; “ ‘Isles of Fear’ to Present Truth About Philippines,” 28 November 1924, Washington Post: 10. The articles were compiled into a single volume, Katherine Mayo, The Isles of Fear: The Truth About the Philippines (New York : Harcourt, Brace, and Company: 1925). For biographical information about Mayo, see “Katherine Mayo, Writer, Is Dead,” 10 October 1940, New York Times: 25. For the Post’s supportive editorials, see “Conditions in the Philippines,” 7 December 1924, Washington Post: EF1; “Vetoing Seditious Propaganda,” 11 December 1924, Washington Post: 6; and “The Philippines As They Are,” 24 January 1925, Washington Post: 6. 19Congressional Record, House, 68th Cong., 2nd sess. (3 March 1925): 5348–5350, quotation on p. 5349. Gabaldon’s remarks about the Mayo articles are in Congressional Record, House, 68th Cong., 2nd sess. (3 January 1925): 1167–1173. 20Congressional Record, House, 69th Cong., 1st sess. (6 May 1926): 8831. 21Bonifacio S. Salamanca, The Filipino Reaction to American Rule, 1901–1913 (Hamden, CT: Shoe String Press, 1968): 113–117, 256n107. 22Golay, Face of Empire: 266–267. 23Congressional Record, House, 69th Cong., 1st sess. (26 June 1926): 12063–12066; Congressional Record, Index, 69th Cong., 1st sess. : 810. 24Churchill, The Philippine Independence Missions to the United States, 1919–1934: 181, 184–185; “Coolidge to Receive Filipino Legislators,” 22 September 1927, Washington Post: 1; “Stimson Named for Governor of Philippines,” 13 December 1927, Christian Science Monitor: 1; “Senate Confirms Morrow as Envoy,” 18 December 1927, New York Times: 23; Larry G. Gerber, “Stimson, Henry Lewis,” American National Biography 20 (New York: Oxford University Press, 1999): 787–790; Congressional Record, House, 70th Cong., 1st sess. (21 December 1927): 916–917. 25Churchill, The Philippine Independence Missions to the United States, 1919–1934: 185–187. 26Hearing before the House Committee on Insular Affairs, Employment of Certain Civilian Assistants in the Office of the Governor General of the Philippine Islands, 70th Cong., 1st sess. (31 January 1928): 7, 19–20. Gabaldon described Guevara’s condition in Hearing before the Senate Committee on Territories and Insular Possessions, Appointment of Governors of the Non-Christian Provinces in the Philippine Islands, 70th Cong., 1st sess. (1 February 1928): 2; Churchill, The Philippine Independence Missions to the United States, 1919–1934: 187. 27Churchill, The Philippine Independence Missions to the United States, 1919–1934: 185–189; Congressional Record, Index, 70th Cong., 1st sess. : 531, 539, 706, 731. 28Congressional Record, House, 70th Cong., 1st sess. (22 March 1928): 5212. 29Churchill, The Philippine Independence Missions to the United States, 1919–1934: 188–189; Congressional Record, Index, 70th Cong., 1st sess. : 736. 30Churchill, The Philippine Independence Missions to the United States, 1919–1934: 189–190; “To Work For Philippines,” 6 April 1928, New York Times: 4. The 1924 and 1928 platforms are similar. See George Thomas Kurian, ed., The Encyclopedia of the Democratic Party, vol. 3 (Armonk, NY: M.E. Sharpe, Inc., 1997): 520–521, 531. 31Hearings before the House Committee on Ways and Means, Tariff Readjustment–1929: Vol. V, Schedule 5, Sugar, Molasses, and Manufactures of, 70th Cong., 2nd sess. (21–22 January 1929): 3288–3292. Guinn Williams of Texas made a similar statement on Guevara’s behalf, see Congressional Record, House, 70th Cong., 2nd sess. (24 January 1929): 2194–2197. 32Herbert Hoover, “Proclamation 1870—Requesting an Extra Session of Congress on Agricultural Relief and Tariff Changes,” 7 March 1929, in American Presidency Project, ed. John T. Woolley and Gerhard Peters, http://www.presidency.ucsb.edu/ws/?pid=22069 (accessed 12 February 2016); Churchill, The Philippine Independence Missions to the United States, 1919–1934: 198–201, 204–206. 33“Urges Wide Powers in Flexible Tariff,” 17 July 1929, New York Times: 11. 34“Haitian Policy of U.S. Praised and Condemned,” 14 December 1929, Chicago Daily Tribune: 10; Congressional Record, House, 70th Cong., 1st sess. (7, 13 December 1929): 261–262, 618–630; Golay, Face of Empire: 281–282. 35Hearings before the Senate Committee on Finance, Tariff Act of 1929 : Vol. XVII, Special and Administrative Provisions, 71st Cong., 1st sess. (12–13 June and 15–18 July, 1929): 260–262; Golay, Face of Empire: 278–282. Smoot–Hawley became law as Public Law 71-361, 46 Stat. 590 (1930). 36“Filipino Pleads for Freedom at Politics Parley,” 1 July 1930, Christian Science Monitor: 5; “Guevara Makes Plea for Filipino Freedom,” 28 October 1930, New York Times: 52; “Reasserts Filipino Stand,” 23 May 1931, New York Times: 8. 37Golay, Face of Empire: 296–298; Pedro Guevara, “Moros Declared to Favor Philippine Independence,” 20 September 1931, Washington Post: M7. 38“House Votes to Free Philippines in 1940; Stimson Is Opposed,” 5 April 1932, New York Times: 1; Congressional Record, House, 72nd Cong., 1st sess. (4 April 1932): 7401–7412, Guevara quotation on p. 7410. 39Congressional Record, House, 72nd Cong., 2nd sess. (13 January 1933): 1769. 40Theodore Friend, Between Two Empires: The Ordeal of the Philippines, 1929–1946 (New Haven, CT: Yale University Press, 1965): 106–108; “Hail Defeat of Veto: Filipino Commissioners Call Independence Grant Unprecedented,” 18 January 1933, New York Times: 2. 41Friend, Between Two Empires: 129–130. 42Congressional Record, House, 73rd Cong., 2nd sess. (4 January 1934): 128–129. 43Congressional Record, House, 73rd Cong., 2nd sess. (19 March 1934): 4836. 44President Roosevelt’s special message was reprinted in Congressional Record, House, 73rd Cong., 2nd sess. (2 March 1934): 3580–3581; Congressional Record, House, 73rd Cong., 2nd sess. (19 March 1934): 4225, 4831, 4842; Congressional Record, Senate, 73rd Cong., 2nd sess. (20 March 1934): 4921, 5164; Public Law 73-127, 48 Stat. 456 (1934); Golay, Face of Empire: 320–327. 45“Calls Oil Tax Move Blow at Philippines,” 3 April 1934, New York Times: 2; “Filipino Says Tax on Oil Is Ruinous,” 2 May 1934, New York Times: 8; Congressional Record, House, 73rd Cong., 2nd sess. (29 May 1934): 9864–9868; Congressional Record, Index, 73rd Cong., 2nd sess. : 613; Golay, Face of Empire: 327–328. Guevara also testified against the passage of H.R. 7835. See Hearings before the Senate Finance Committee, Revenue Act of 1934, 73rd Cong., 2nd sess. (12–15 March 1934): 389–394. 46Guevara’s appeal is in Congressional Record, House, 73rd Cong., 2nd sess. (11 June 1934): 11079–11080; Congressional Record, Senate, 73rd Cong., 2nd sess. (13 June 1934): 11273; Congressional Record, House, 73rd Cong., 2nd sess. (14 June 1934): 11351–11546; Golay, Face of Empire: 329–330; Philippine Currency Act, Public Law 73-419, 48 Stat. 1115 (1934). Per Golay, the devaluation profit is the dollar value increase of gold equivalent to the currency reserves on deposit in the U.S. when the convertibility of the dollar was suspended. 47“Guevara Statement Stirs Manila Storm,” 19 June 1934, New York Times: 8; James G. Wingo, “Guevara Still in the Fight,” 7 July 1934, Philippines Free Press: 9. 48“Philippine Elections,” 12 July 1934, Wall Street Journal: 4 ; “Solons Select New P.I. Envoys to Washington,” 21 August 1934, Philippines Herald: 1, 2. 49H. W. Brands, Bound to Empire: The United States and the Philippines (New York: Oxford University Press, 1992): 160–161. 50Congressional Record, House, 74th Cong., 1st sess. (21 January 1935): 716–717; Congressional Record, Index, 74th Cong., 1st sess. : 633, 770. The bill became law as Public Law 74-56, 49 Stat. 218 (1935). 51Vicente Albano Pacis, “A Philippine Protectorate?,” 1 October 1935, Washington Post: 9. 52“Quezon is Opposed to U.S. Protectorate,” 24 August 1935, New York Times: 7. 53Guevara did not submit a formal letter of resignation. The terms of the Tydings–McDuffie Act limited the Philippines to one Resident Commissioner with the inauguration of the Commonwealth. With Quezon elected and prepared to appoint a new commissioner, and with the House of Representatives on recess until January 1936, Guevara saw no official reason to return to the United States. 54“Guevara Will Retire From Political Life,” 25 September 1935, Philippines Herald: 1; “Guevara is Opening Manila Law Office,” 26 September 1935, Philippines Herald: 1; “Guevara’s Protectorate Stand,” 5 October 1935, Philippines Free Press: 28. President Quezon appointed Quintin Paredes to serve as Resident Commissioner on February 14, 1936. See also “Quintin Paredes,” Biographical Directory of the United States Congress, 1774-Present, http://bioguide.congress.gov/scripts/biodisplay.pl?index=P000050. 55Vicente Albano Pacis, “The New Philippines,” 14 December 1935, Washington Post: 9; “Filipino Urges U.S. Pact,” 16 February 1936, New York Times: 26; “Guevara Heads Mining Firm,” 24 January 1937, Tribune (Manila, PI): 10. "Pedro Guevara" in Asian and Pacific Islander Americans in Congress, 1900-2017. Prepared under the direction of the Committee on House Administration by the Office of the Historian and the Office of the Clerk, U.S. House of Representatives. Washington: Government Publishing Office, 2018.